Non-enveloped, head-tail structure. Head is about 75 nm in diameter. 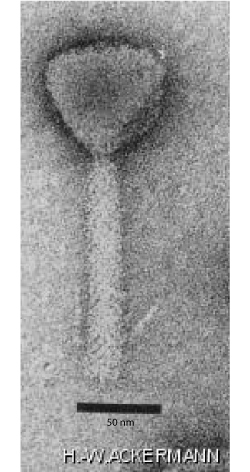 The tail is contractile, about 140 nm in length with four short straight tail fibers and a baseplate that separates from the sheath upon contraction. The tail exhibits no transverse striations, but presents a criss-cross pattern. Linear, dsDNA genome of about 65-75 kb, encoding for 90-130 proteins. Genes are transcribed by operons. PB1 phages lack a phage-encoded RNA polymerase and they depend entirely on the host transcriptional machinery. 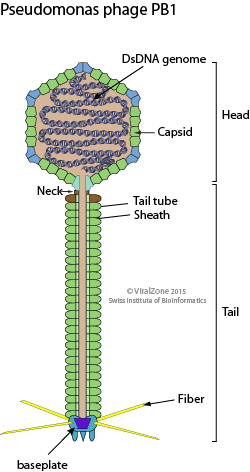 Replication of viral DNA. Transcription and translation of late genes.